Photograph of Anna Maria (Emma) Klaus with her children. Back row from left to right: John, Margaret and Adam. 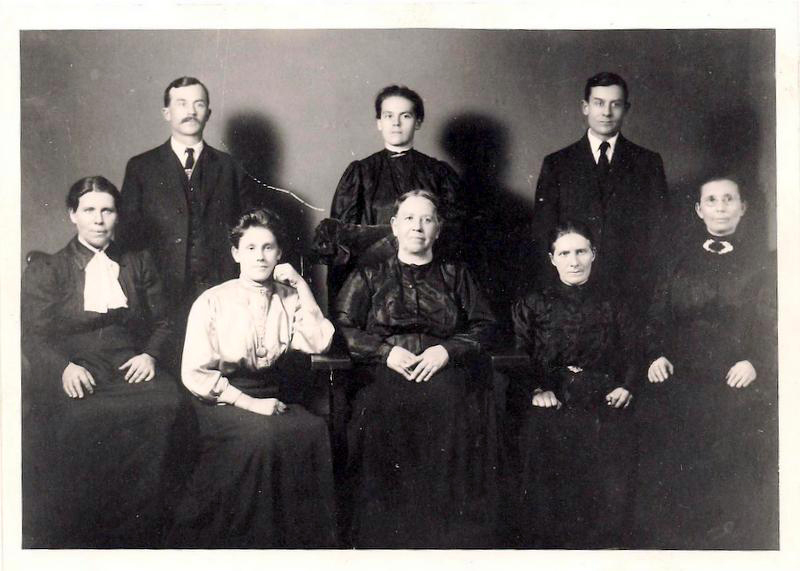 Front row from left to right: Margaret Krieger, Elizabeth, Anna Elizabeth and Annie Klaus (the daughter of Henry Klaus and his first wife, Katharina Yost). Photograph courtesy of Karen Drier Esayian. ​Anna Maria Giebelhaus was born on May 13, 1844 in Norka, Russia. Her parents were Conrad Giebelhaus (born 1821-1866) and Katharina Yost (born 1819-1897), both died in Norka. Anna Maria, known as Emma, married Johannes Krieger (born 1844) on January 25, 1866 in Norka. A daughter, Margaret, was born in 1866. Johannes died January 14, 1868 in Norka. Anna Maria married for a second time to the widower Heinrich Klaus (born 1836) in Norka on August 16, 1868. Henry had previously been married to Katharina Yost, who died in February 1868. 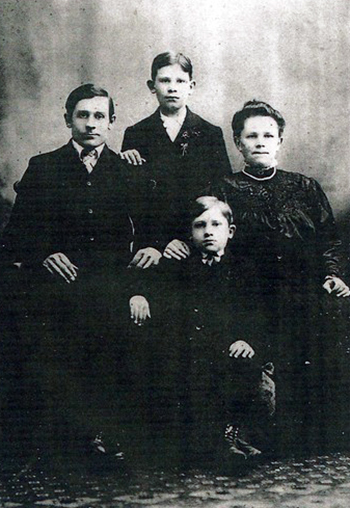 The children born to Anna Marie and Henry include: Heinrich (born 1868), Anna Elizabeth (born 1870), Adam (born 1874), Johannes (born 1876), Margareth (born 1880) and Elizabeth (born 1884). Johannes and Anna Marie Klaus with their children Henry and Elizabeth. Photograph courtesy of Karen Drier Esayian. ​Heinrich Klaus died January 3, 1894 in Norka. 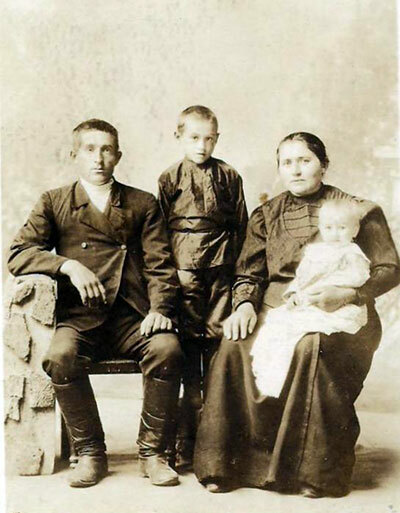 After Heinrich's death, Emma left Russia on June 13, 1906 with her son Adam (1874-1927), his wife Katharina Elisabeth (Giebelhaus) Klaus (1871-1934), and their children and her daughter Elisabeth (1884-1976). Adam Klaus and Katharina Elisabeth Klaus (née Giebelhaus) with children Adam and Henry. Photograph courtesy of Karen Drier Esayian. ​When she left Russia, her husband Heinrich and four of her nine children from her second marriage had died. Elisabeth Klaus, from Henry's first marriage was considered part of Emma and Henry's family. All of Emma's children settled in Portland, Oregon. Daughter Elisabeth Klaus (1884-1976) married John Weber in 1908 in Portland, Oregon. John (1884-1948) was born in Beideck, Russia. Elizabeth Weber (née Klaus) and John Weber with their children Harold and Leona at their home on Rodney Avenue. Arthur Henry and his twin and Kenneth Carl were born later. Photograph courtesy of Karen Drier Esayian. ​Emma's daughter Anna Elisabeth (Anlis or Alice) Klaus (1870-1943) married Henry Deering (Döring) (1873-1914) in 1893 in Norka. They immigrated via Canada in 1913. Together they had seven children, only three surviving to live in Oregon. 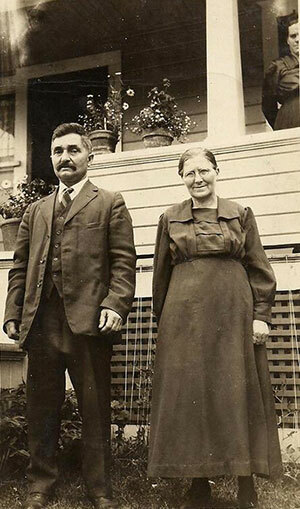 After Henry died, Anlis married Frederick Rennich in 1920 in Portland, Oregon. Anna Elizabeth (Alice) Deering with her husband John Rennich in July 1923. Photograph courtesy of Karen Drier Esayian. ​Emma's son John (1876-1967) married Anna Marie Miller (1876-1946) in Norka in 1897. 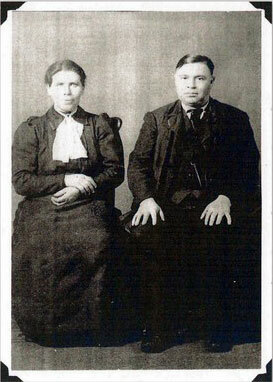 They immigrated with their four oldest children in 1906. Daughter Margaret Klaus (1880-1967) married Conrad Krieger (1878-1945) in Norka in 1900. 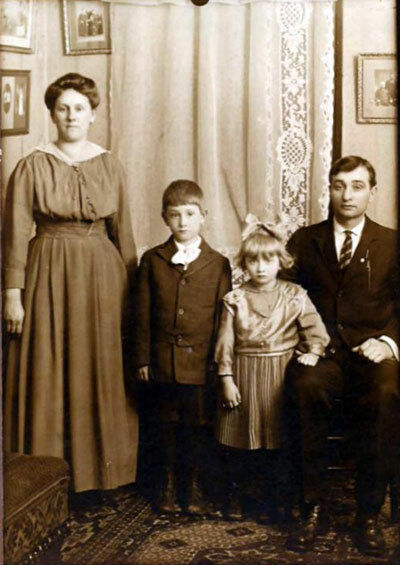 Margaret and Conrad and their five oldest children immigrated to the United States in 1912. 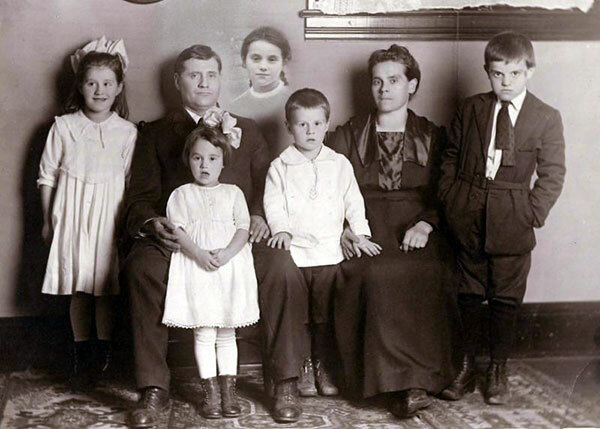 Margaret Krieger (née Klaus) and Conrad Krieger with children Amelia, Rachel, Walter, John and Elizabeth (inset). Photograph courtesy of Karen Drier Esayian. ​Emma's daughter from her first marriage, Margaret Krieger, married Heinrich Miller (1868-1947) and they settled in Portland. Margaret and Henry Miller. Photograph courtesy of Karen Drier Esayian. ​Of Emma's siblings, John Giebelhaus (1841-1922), Heinrich Giebelhaus (1847-1920), and Anna Elisabeth Giebelhaus Miller (1850-1919) all settled in Portland, Oregon. One sister, Katharina (1856-1931) remained in Russia. 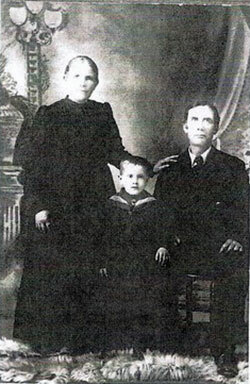 Heinrich and Sophie (née Reispeck) Giebelhaus with their grandson. Photograph courtesy of Karen Drier Esayian. ​Emma's step daughter, Annie Klaus, married a man with the family name of Schmer. Emma died on July 2, 1931 in Portland, Oregon. Karen Drier Esayian (June 2014).